Keeping busy finishing some turtle artwork, and the accompanying videos for my YouTube channel. Here are the latest entries in the finished pieces. And here are the latest things I’ve been doing. Mini Drawings: these are 5″ x 5″ colored pencil drawings of turtles and bearded dragons. These are available through both Society6 and RedBubble shop links on the homepage. I’m also selling the originals on Etsy for $12 each. I’m making new ones each day, with new color variations. Here’s a quick video on how I went about making one of them. 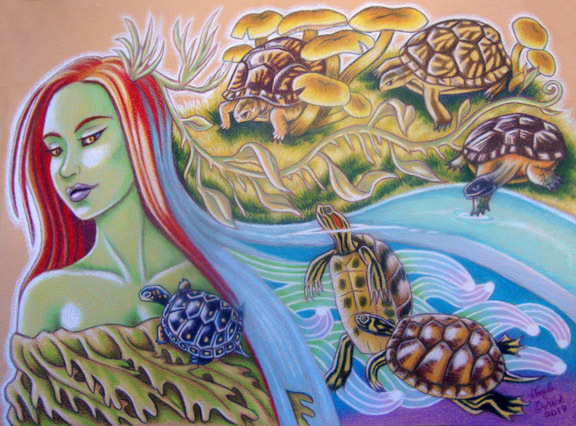 This artwork depicts many of North America’s common species; (from top left) Eastern Box Turtle, Florida Box Turtle, Wood Turtle, Yellow Bellied Slider, Red Eared Slider, and the Spotted Turtle. This one is available as prints and other products through the links on the homepage. I have started adding narration to my videos explaining what I’m doing in each artwork. Here are a few videos I made for each stage of working on the above artwork. That’s it for now. I’m always keeping busy, so if you don’t hear from me here on the blog, please check out the links on the homepage where you can follow me on Facebook, Instagram, and any of the shops I run online.